Iowa Wild issued the following announcement on Nov. 30. Iowa Wild (12-4-3-2; 29 pts.) fell to the Colorado Eagles (10-7-3-0; 23 pts.) by a score of 3-2 in the shootout Friday night. Iowa’s point in the contest moved the team into first place in the Central Division. Defenseman Carson Soucy gave the Wild the 1-0 lead at 6:50 in the first period. With the puck loose in the slot, forward Cal O’Reilly poked it back to the point, where Soucy picked it up. Skating into the left circle, Soucy unleashed a wrist shot over the left shoulder of goaltender Pavel Francouz (27 saves) for his second goal of the season. O’Reilly’s assist is the 17th of the season for the Wild captain and third most in the AHL. The goal also marked the 15th time in 21 games Iowa scored first. At the end of the first period, Iowa led 1-0 while outshooting the Eagles 13-4. In the second period, Colorado scored two goals 24 seconds apart to turn a 1-0 deficit into a 2-1 lead. At 17:55 in the middle frame, forward Travis Barron skated down the right side of the ice before roofing a shot on goaltender Kaapo Kahkonen (24 saves), tying the game at 1-1. Earning assists on the play were defensemen Mason Geertson and Anton Lindholm. The Eagles made it 2-1 at 18:19 when forward A.J. Greer drove to the net and snuck the puck through Kahkonen’s five-hole for his seventh goal of the season. Defenseman Sergei Boikov and forward Julien Nantel notched assists on the score. Through 40 minutes of play, Colorado held a 2-1 lead and had a 21-20 shot advantage. 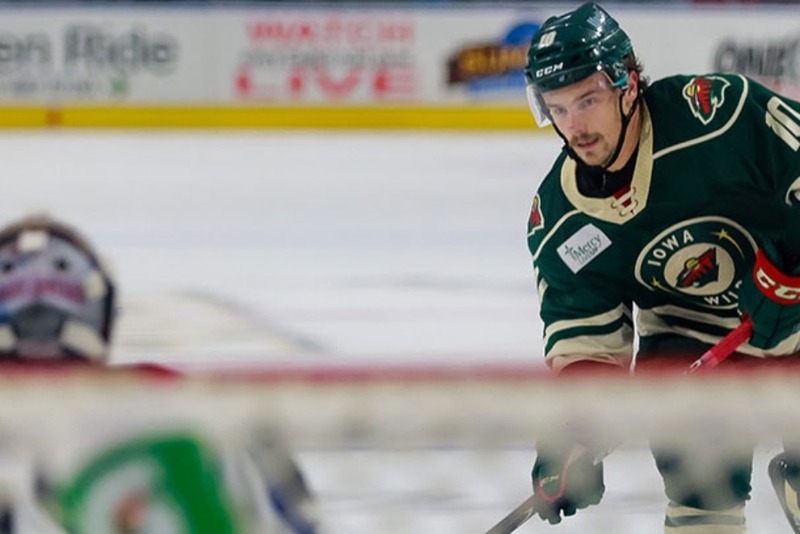 Wild forward Colton Beck potted his sixth goal of the season to tie the game at 2-2 at 6:34 in the third period. After a face-off from the left circle, a Colorado defender lost the puck just to the right of Francouz. Forward Mike Liambas slid the puck across the crease to Beck on the back post, who slammed it across the goal line for the tally. Liambas’ assist was his fifth of the season and ninth point of the year, setting a new career high at the AHL level. With the game tied at 2-2, the game went to overtime and after neither team scored, the shootout. In the shootout, Colorado got goals from forwards Michael Joly and Martin Kaut, while Iowa got a tally from forward Gerry Fitzgerald. On Iowa’s final attempt, Francouz stopped defenseman Louie Belpedio, giving the home side the 3-2 victory. Final shot totals were 29-27 in favor for Iowa and the Wild finished the game 0-for-6 on the power play. The overtime loss extended Iowa’s point streak to eight games, both overall and on the road. The eight-game overall point streak is the second longest active streak and fourth longest of the season in the AHL. The eight-game road point streak is the longest streak in the AHL this season. Iowa closes out the season series against the Eagles with a rematch tomorrow night at Budweiser Events Center. Puck drop is at 8:05 p.m. CT.